The first Sakya monastery built by its founder Khön Könchog Gyalpo in 1073 in Sakya, Tibet, was the principal seat of the Sakya lineage. 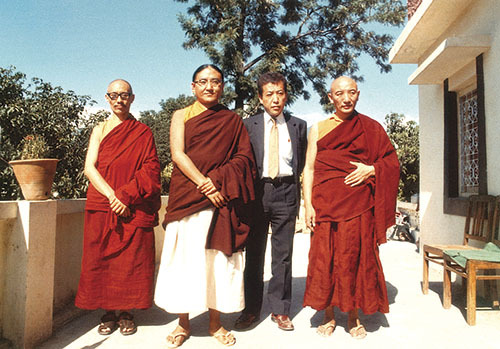 Following the exodus of Tibetans in 1959 from Tibet, the Sakya monastery was re-established in India in 1964 as the Sakya Centre by His Holiness the 41st Sakya Trizin. It continues the important function of being the main seat of the Sakya order and the personal monastery of His Holiness Sakya Trizin, where the monastery was passed through successive bone lineage holders of the Khön family to the present day. The Centre is a monastic Institute, which offers education in Buddhism in general and Sakya tradition of Tibetan Buddhism in particular. The monastic school teaches basic Buddhism, rituals, ritual music and dance, art and other related subjects. After completing their studies at the monastery, monks can attend either Sakya College or the Sakya Institute of further education in Higher Buddhist Studies. The Centre is a charitable society registered under the Societies Registration Act of XXI of 1860. It accepts students from all over India and from the neighboring countries of Nepal and Bhutan irrespective of caste, creed or race. The number of Sangha increases every year with new entrants joining the Centre regularly. The main sources of income for the Centre are the donations from devotees and aid agencies, as well as sponsorships and grants through the Central Tibetan Administration in Dharamsala. The 1959 political upheaval in Tibet triggered a massive exodus of Tibetans to India and neighboring countries and left a large void in the religious and cultural life of the Tibetans. 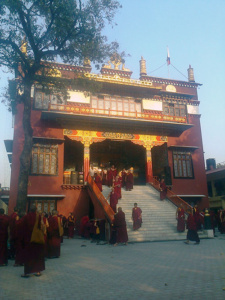 Once in India, under the benign leadership of His Holiness the 14th Dalai Lama and with humanitarian help from the government of India and various aid agencies, rehabilitation centres and schools were soon established and efforts were made to preserve and promote the distinct religious and cultural heritage of the Tibetans. 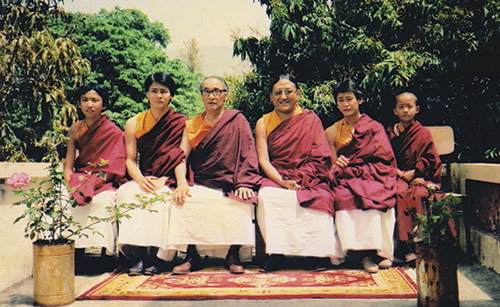 His Holiness the 41st Sakya Trizin formally established the Sakya Centre in 1964. One of the primary objectives of the Centre is to preserve and promote the rich cultural heritage of Tibetan Buddhism in general and in particular that of the Sakya Tradition. In the initial years of its inception, the members faced many hardships due to lack of funds, language difficulties and problems in adjusting to the new environment. In the beginning, the caring owner of Pratap Kothi kindly rented his hall to the Centre, and for quite some time this served as the Sakya Centre. Soon the Centre had to vacate the hall and the monks had to live in tents on another piece of land also kindly provided by the owner of Pratap Kothi. The tents not only served as dormitories, but also as the shrine room and kitchen, etc. After some time the monks had to disperse from this makeshift establishment due to acute financial difficulties and it was not possible to run the Centre. However, with the blessings of His Holiness the Dalai Lama and the thoughtful guidance of His Holiness Sakya Trizin together with the continuous efforts and dedication of the then members, Sakya Centre once again was re-established-this time in an old rented bungalow at 187 Rajpur Road, Dehradun. It soon became necessary to secure the bungalow and the land around it in order to accomplish the objectives of the Centre. His holiness the Dalai Lama kindly gave financial support so that the property could be purchased. Loans and donations from various aid agencies and individual supporters also contributed to this major endeavour. Monks once again gathered and young monks also joined the Centre. 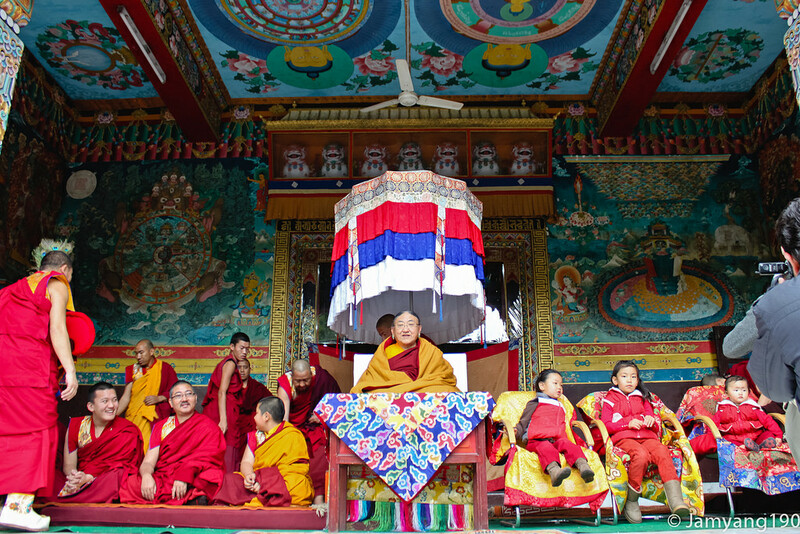 A study curriculum was then developed and Sakya Centre functioned as a monastic institute imparting traditional education to the young monks while the elder monks continued with their spiritual practice as they had previously in Tibet. The Centre managed to take firm roots and is now a vibrant and energetic religious community. With the establishment of the Sakya Academy which would impart both secular and religious education, the Sakya Centre continues to be a monastic institute where its course of study is based on the traditional monastic educational system mirroring that of the monasteries in Tibet . The first semester of the academic year starts in the beginning of the fifth lunar month. This leads straight into the second semester, which starts in the beginning of the tenth lunar month. The students’ holidays commence on the fifteenth of the third lunar month and lasts for one and a half month. Classes I, II, III Praises to Lord Buddha, The Sixteen Arhat Ritual, Praises to the Six Ornaments and the Two Excellencies. Praises to Mahasiddha Virupa and the Five Sakya Masters. The Tara Ritual and the Samantabhadra Prayer. On completing Class VIII, students can either join Sakya College or the Sakya Institute in order to study higher Buddhist Philosophy. The Sakya Centre performs annual grand rituals and pujas throughout the entire year. These rituals and pujas are usually performed with His Holiness as the Vajra Master. In additional, at the requests of devotes and sponsors, pujas and scripture recitations sessions are also held frequently.